Double-wall vacuum insulation keeps your drinks hot or cold for hours! Acrylic push-on lid with slider. 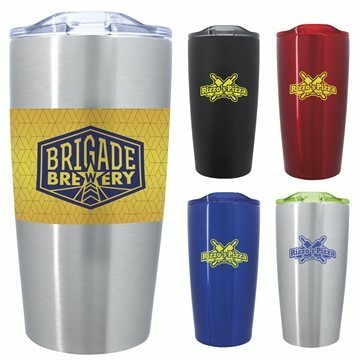 Mix-and-match body and lid colors to create your unique tumbler. Overall Reviews: WRITE A REVIEW (4)5.005Roamers Vacuum Tumbler - 20 oz. Great job! It was what I wanted. I really appreciated being able to get a free sample so I could see what the product was like. It's cool. People actually clamor to get one at the trade shows it's the thing they want to walk away with. They're very handy. We liked that logo. I cannot think of anything I didn't like about my experience. Thank you. Product was actually nicer than what the picture presents. Overall very satisfied. Products were great!